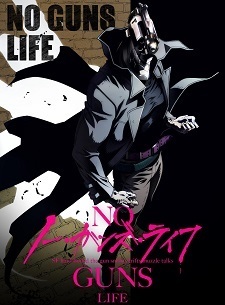 This year's April issue of Shueisha's Ultra Jump announced on Tuesday that Tasuku Karasuma's No Guns Life manga is being adapted into a TV anime. The anime series will be produced by animation studio Madhouse. Ex-soldier Juuzou Inui has one question—who turned him into a cyborg and erased his memories? Karasuma initially launched the sci-fi action manga as a one-shot in August 2013 issue of the magazine, which was published again in the April and May 2014 issues. Ultra Jump began serializing the manga from its October 2014 issue. Shueisha published the eighth volume on Tuesday. VIZ Media licensed the manga in English last month and plans to ship the first volume this September. The Hakuhodo DY Music and Pictures booth at the AnimeJapan 2019 event revealed a teaser preview for the anime series on Saturday. As long it's Madhouse, it must be good. People really thinking that Madhouse is the same that it used to be. Yes, they’re not terrible by any means (like, not Studio Deen level), but they are not what they to, probably because of all the financial difficulties they’ve experiencing since 2008. And before anyone mentions OPM, that was a one in a lifetime scenario. It was a passion project with animators from all over the industry involve (specially Bones) and came together, not because of Madhouse, but because of the love those people had for OPM. But even then i have some hope, seeing the at times high quality and competent production values of boogiepop. Chihayafaru is getting a new season this april. And they aren’t going to do a second season of NGNL probably because of some serious accusations against the Author of the novels, who is accuse of plagiarism (don’t knwo the specifics). Based on what i understand, that was also the reason the film was delayed for quite some time. A simple accusation may not seem much in the west, but in Japan it’s a big deal (enough to withhold an adaptation). And another guy here who did not read all of the information. Yes, the NGNL author was accused in copying some character poses for promo arts. Yes, another illusttrator got fired because of the same thing a couple of years prior and it rwesulted in the delay of vol. 8 (or 7 do not remember) of LNs.Though NGNL is two popular and there was no serioes circumstances. That thing is not a deal for a long time already. The more probablre reason why there's still bno NGNL 2 is either because of the staff being busy with other projects (thry made YoriMoi just last year) or with publishers thinking that full TV season is not worth investment. Automatic plan to watch list! seems interesting . ill definitely check this one out . If they bring the dispairing cyberpunk sound from Kenji Kawai....I´m probably in. Now that's some news! Expected for this anime for a long time, but not even on my wildest dreams I thought about a Madhouse adaptation. It's good to be alive. It made me think or Overlord and it's gonna be directed by Overlord's director. Plus, Madhouse. Gotta be awesome. On one hand, I'm interested because friends who read the manga told me this series is worth trying. On the other hand, I'm not optismic about this since Madhouse is pretty much a shadow of its former self now. Not to mention the director and series composer doesn't seem promising. Feel like I am being Click Baited. Still no NGNL. This is my type of show. Definitely going to consider watching, but I'm not getting my hopes up.